With more than 20 years of experience as a leader in the learning and development sector, our passion for delivering impactful and goal-orientated training is evident. Our approach to custom training solutions combines our expertise in all aspects of planning, designing and execution to offer a versatile approach to learning that inspires. Cognition is our robust Learning Management System (LMS) that lets your employees use an LMS that is as intelligent and intuitive as they are. We designed our LMS to be where training and accountability meet system flexibility and ease of use. 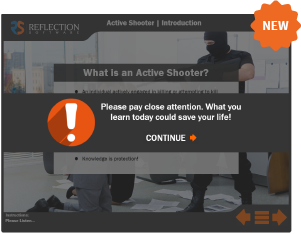 We provide you with a customized solution that fits all your training needs. We give you the freedom to pick, choose, and combine resources to get the support you want, the way you want, when you need it. 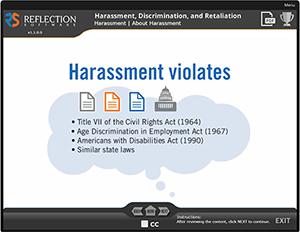 Reflection Software is proud to provide learning solutions that are essential to every workplace. Each module can be customized with your organization's logo and policies. Take a look at our current course offerings to learn more.